The drone offers a Yuneec UpdatePilot, using which a user can update the drone with the latest software model. 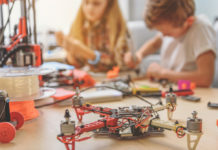 Due to the unlimited features and options offered by it, the sUAS can be used in many types of applications and as more awareness builds up in different communities. 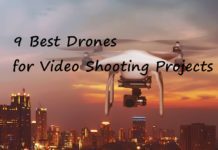 Since the last few years, drones have become very popular due to their mind-boggling features and ability to click pictures and reach places where it may not be very easy for any other vehicle to reach with such ease. As such, their utility has also increased phenomenally after their legalization by the United States Federal Aviation Administration (USFAA) and also due to the fact that they can now be used in a plethora of industries. To start with, there were a lot of agricultural drones on offer that used to provide farming options to cultivators and agricultural enthusiasts. Taking a cue from their popularity, other industries also started making use of drones with features customized for each specific application. Within a short period of time and after the advent of many different drones, a need was felt for a drone that could effectively help in many types of industries and yet retain its typical charm. Research ensued worldwide and it brought forth many new types of Small Unmanned Aircraft Systems (sUAS) and amongst them, the Yuneec H520 has made its mark as one of the most versatile drones of all times. 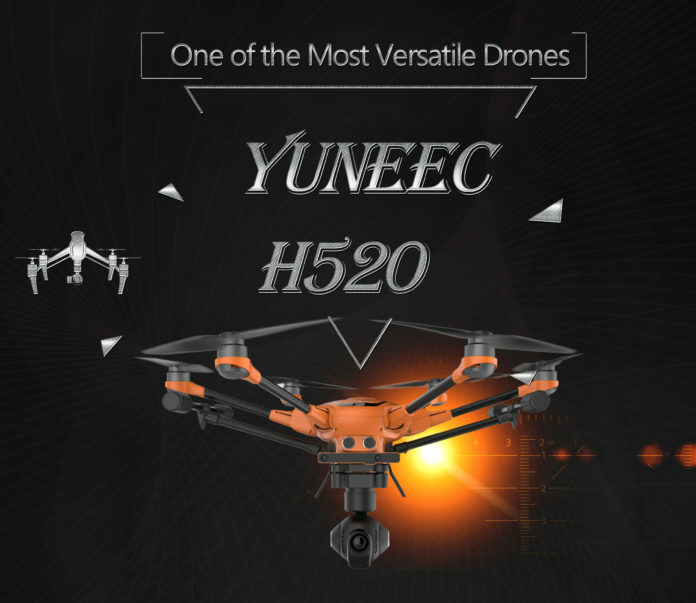 The H520 has been made by the trusted drone manufacturers, Yuneec International Co. Ltd., which is a Hong Kong-based company. It is one of the pioneers of electronic aviation technology since 1999 and has brought forth successful models like the Q500, Tornado H920, Typhoon H, etc. It is a commercial hexacopter that has been developed to help in a lot of applications and industries. It is a one-stop solution for any drone-related need as it offers an enhanced flight time and a proven and sophisticated technology that can help in improving processes across sectors. 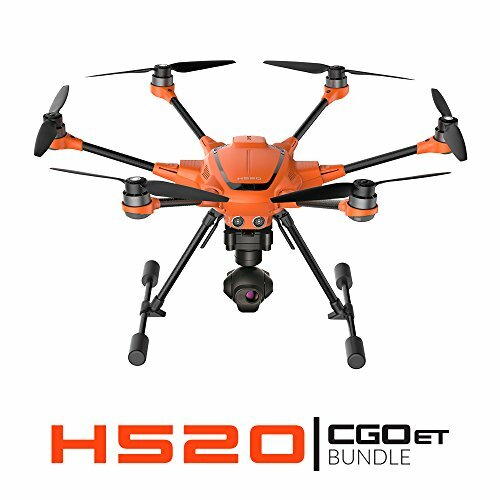 The H520 is a very accomplished and flexible drone that can be used successfully for applications like inspection, security, surveying, law enforcement, construction, mapping jobs and cinematic imaging systems. The H520 is a drone that can aid enthusiastic professionals with a wide range of capabilities. The fact that it can be used across industries is also a turn-on feature for many users. The six-rotor aerial system has been devised keeping in mind the needs of the inspection sector so that it can be able to facilitate a stable and accurate flight. It is further equipped with long focal-length lenses that can absolutely be useful for taking clear images from a considerable distance. Pictures and videos from the drone can be helpful for many types of analysis. It has a considerable data storage option and that can also be used for sharing pictures and videos using the ST16S Ground Station. There are also enough options available so that they can be directly delivered in 20MP still photographs or 4K/2K/HD videos. The H520 sUAS offers a superb stability in all types of challenging environments. Even if the outside atmosphere remains a lot windy, the drone can easily hold on to it and still offer pictures and videos that can be quite clear and marvelous. It can keep up its flight in many types of harsh conditions even when a manned inspection may not be feasible at a place and that can be quite pleasurable for anyone who has deployed it for a purpose. Flight speed control is a privileged feature of the drone that offers the most lethargic speed attainable just above the stop flight condition so that maximum accuracy can be achieved in challenging situations. One of the noteworthy features of the drone is its assuredness regarding its flight data, images and, videos that are clicked by it. Users can be sufficiently relaxed to know that all data captured by the equipment stays intact between the device and the user. Yuneec has no role to play in any type of data that is handled by the drone after it is sold off to a customer. All data belongs to the user. The H520 sUAS and the ST16S remote control communicates in a one-to-one model. There is no data transfer involved with servers in the Hong Kong, USA or anywhere else around the globe and a user can stay sufficiently assured that no one is, therefore, prying on an operation. Hence, data related to flight, log files, pictures, and videos remain in the exclusive possession of a user and are not saved, voluntarily or involuntarily, across any external server anywhere in the world. Therefore, with respect to data privacy, it offers ample opportunities to safeguard them completely and use them as per one’s liking and applicability. In applications that may need a large amount of data to be processed simultaneously, the camera options may have to be swapped or refurbished frequently. Moreover, if there is a time-dependent application with a large amount of data processing need, that may also call for alternate camera strategies. In such a scenario, the drone may have to work tirelessly and the accompanied cameras may have to be changed each time without any break in operations. Luckily, the H520 cameras are hot-swap enabled on the drone platform thereby helping in achieving a considerable saving of time. This can help in eliminating the need for an elaborate restart/power down of the hexacopter system and thereby help in saving much time and resources. This is further helpful for data storage so that the need of multiple locations and storage devices may be done away with. Hence, whether there is a need for wide focal-length data capture, long focal-length or thermal imaging, memory cards can be easily interchanged between different devices. 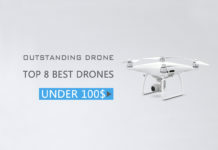 For all the three different types of cameras -E90, E50, and CGOET, that the drone sports – it will be better to highlight them one by one. E90 – The E90 camera is a gimbal stabilized, high-resolution, wide-angle photography system that is perfectly made for applications that need top quality images and videos. It is perfectly suited for applications like search and rescue, 3D modeling/mapping and professional movie applications. It is equipped with the latest H2 high-speed image processing chip and a 20 MP 1-inch sensor. 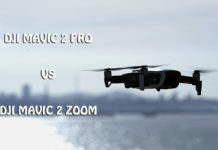 The fast release and locking mechanism of the airframe mounting system and the gimbal ensures that there is a fast and easy camera exchange in hot swapping mode. The cameras that can be swapped with this system include CGOET and the E50. It is fitted with a 23 mm lens that promises low distortion and up to 4K resolution can be achieved by it at 60 frames per second. It has a 3-axis stabilized gimbal feature that offers a precision of +/- 0.02 degrees. The adapter lens ring of the camera is threaded in such a way that a standard ND filter of 40.5 mm can easily fit into it. E50 – In a very small size, this camera offers a substantive lens quality. This photography system is a high resolution, medium focal length imaging option that is well suited for use in the movie and inspection applications. It makes use of its high aperture 1/2.3 inch CMOS imager so that still images can be clicked with its 12 MP camera. The camera can be completely controlled using the ST 16S transmitter. It also allows histogram for sufficient exposure control. 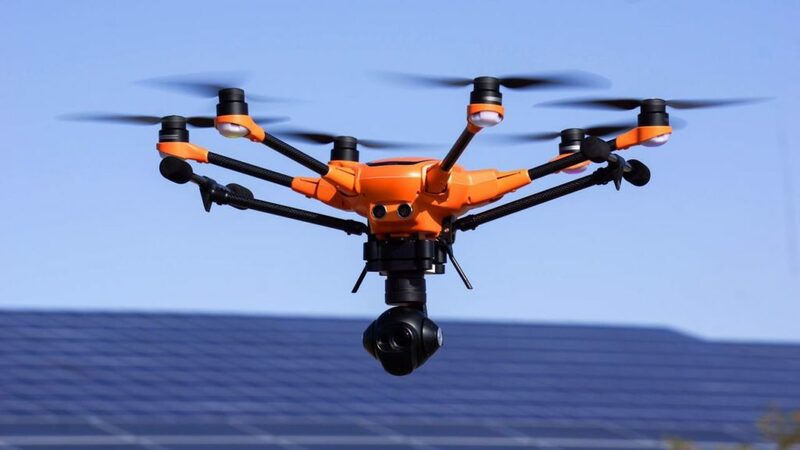 The camera allows a 4K resolution at 30 frames a second and is very suitable to carry out inspections of wind turbines, communication towers, and other vertical establishments. Any important details in an entity can be easily captured by its 40 mm equivalent lens while keeping itself away at a sufficient distance from the entity. CGOET – The CGOET is an exclusive combination of a low light and thermal imaging camera that is empowered with a 3-axis gimbal and can continuously rotate around 360 degrees. The thermal imaging camera is useful in indicating the relative temperature difference of the measured image. Its 1080p residual light IR lens is particularly helpful in snapping images in low light conditions as it has 20 times more sensitivity than a normal human eye. It has an adjustable temperature detection, display, and measurement option that can be very helpful in applications like construction, firefighting, solar inspection, search and rescue and law enforcement. It can easily capture video and infrared images with similar positioning using a single flight plan that can be very much satisfying. The ST16S is an all-around controller that can be used both as a transmitter and a receiver for the H520 sUAS. Absolute flight control can be achieved over the drone using the remote controller without the need for any other accessories. Hence, images and videos can easily be captured by it with considerable ease. The controller is operated through the Android OS and offers a 7-inches LED screen so that real-time flight footage can be viewed over it. Alternately, the controller can also be used as a mission planner so that flights can be planned at the touch of a button and a preferred journey can be easily executed with considerable ease. Without using any third-party expensive software, many types of utilities can be completed with the help of Yuneec DataPilot. The software system can help in creating and managing orthomaps, crop information imagery and 3D scans in a particular area or on the desktop for recallable and repeatable flight paths. It is a total solution for waypoint and mapping-based drone flight. The software has been particularly integrated into the system and can be efficiently utilized by any user. Accurate and adequate flight plans can be made using the software without involving any other entity. There are many options of pre-planning a flight so that they can be recalled later or planned off-site and can be easily moved to the control system using email or any other storage media like a micro-SD card, etc. Automated mission control can be achieved with the DataPilot so that a survey resolution can be defined and a platform can be provided for a flight. It can also help in map storage from many map service providers in places where there is no connectivity and help in a way out with accurate waypoint placement for areas where there are no updated maps available. 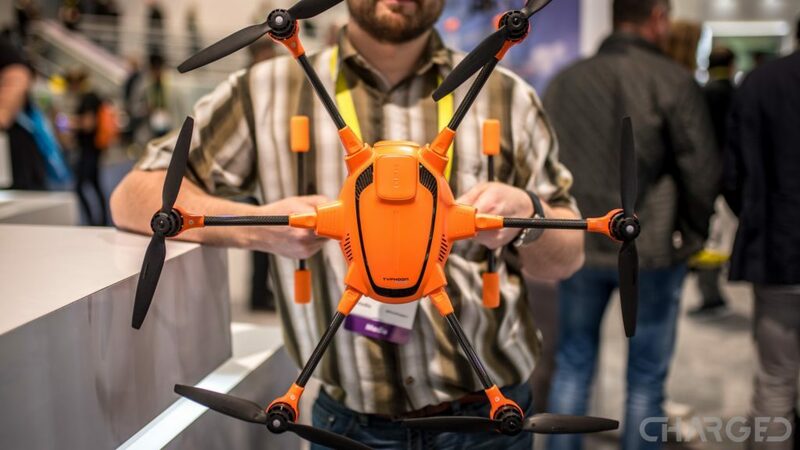 The retractable landing gear of the H520 is one major attraction of the drone. 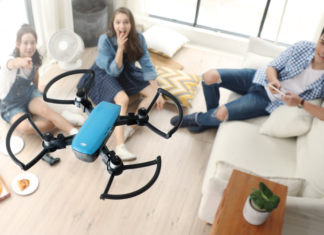 It helps in the landing process of the drone in a very convenient way and at the same time, it completely retracts itself so that a full 360- degree view can be achieved for the best camera visibility. Therefore, useful data can be captured by it in the most satisfying way possible. Moreover, complete service packages are also available and can be bought separately. Software development teams and power users can be particularly benefited by the Software Development Kit (SDK) provided with the H520 so that the hardware and software can be optimally used. These tools can help in creating many types of useful applications that can unleash the power of the sUAS so that effective monitoring and deployment can be performed using it. Without knowing anything about robotics, the SDK can be used comfortably for developing a wide range of applications. Using the mobile SDK, many attractive features of it can be easily accessed for use in the hexacopter. Some of the worthwhile features include flight control access, real-time telemetry information, logging, live video-streaming, gimbal and camera systems, waypoint missions and geofencing. There are some other features that can be expected in the near future, these include additional telemetry, FPV (first-person view) video support, advanced missions and Intel RealSense control. Benefits of Using the Yuneec H520 – There are certain outstanding benefits of using the drone. These are discussed as follows. It has been specially designed for professional, personal and government applications. Even with all the available cameras, the takeoff weight of the drone is below 2 kgs. It has a low interference and high accuracy compass. It offers video encryption using a dynamic password as per the WPA2 standard. Its software has been developed on the reliable PX4 code. Guarantees an efficient and noiseless flight time of at least 28 minutes with the CGOET and 25 minutes with the E90. It comes with a ST16S controller with a multilingual and effective DataPilot software, voice output and a 7 inches touchscreen display. A user can create own maps, offline maps can be accessed and mission planning can be done on the ST16S or on a computer. Mapping can be done in 2D/3D. Resolution can be defined in altitude or inches per pixel. There is available SDK so that a user can plan own application as well as work on any third party software. A very small setup time and very less space is needed for the drone. It comes with attractive hot swappable gimbal/camera systems. The drone offers correct and pinpoint positioning by assessing GPS, Galileo and Glonass satellites. With its bright orange painted body, it offers a superb visibility. There is no transfer of data to any external server anywhere in the world. There is an added safety and security feature in the form of smart sonar collision avoidance for a relaxed flying experience. There are many types of maintenance and service packages available for the sUAS. Through the ST16S, the drone’s live pictures can be directly transmitted by the HDMI to larger monitors for a better viewing experience. Many types of survey and waypoint missions can be conducted using it that includes construction surveying, accident reconstruction, orthomaps, S&R tasks, crosswise flights, perimeter security, 3D scans and area inspections. In case of a battery change or when a mentioned place is to be scanned, the DataPilot helps in automatically charting out the required flight route. For accessing a similar flight route, previous flight data can be saved for future use. It can also be tethered and there is ample accessibility for the same. 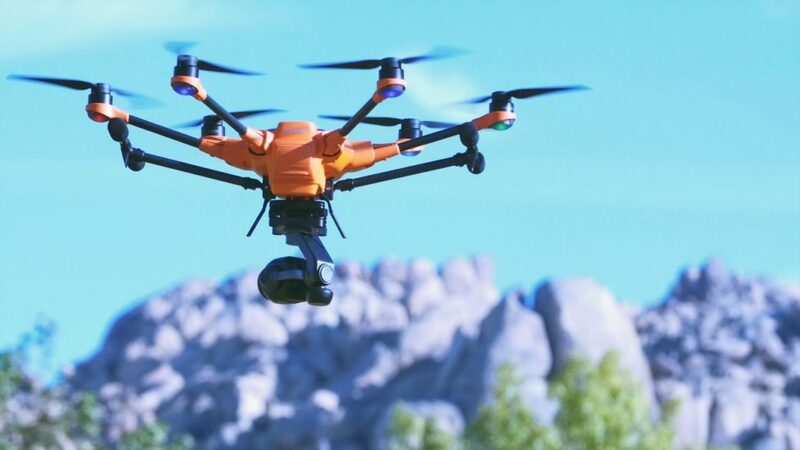 There is an availability of retractable landing gear with a 360-degree rotatable camera gimbal to get an accurate alignment for a complete all-around view. 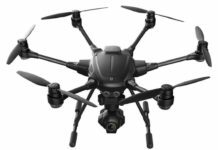 The Yuneec H520 is a hexacopter drone that is simply outstanding due to its attractive features and unlimited software and camera options. Additionally, it also offers a Yuneec UpdatePilot, using which a user can update the drone with the latest software model. Due to the unlimited features and options offered by it, the sUAS can be used in many types of applications and as more awareness builds up in different communities, there is a greater demand for the drone. Next articleHobby Drone Insurance – Do you Need Insurance for a Hobby Drone?